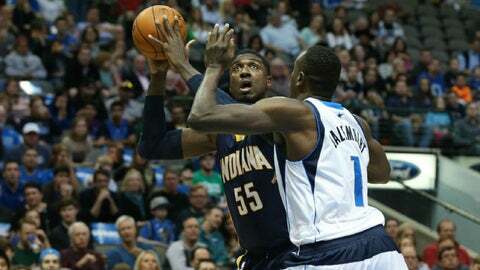 Roy Hibbert and the Pacers have lost four straight games. DALLAS — Devin Harris rolled through the lane, hit a layup and pumped his fist when the whistle blew for a foul. Vince Carter tipped a loose ball three times before emphatically grabbing the rebound, scowling while the play was still going on in a sequence that led to a 3-pointer. The Dallas Mavericks have shown some fight to answer to their longest losing streak of the season. Now it’s time for the Indiana Pacers to do the same. Harris and Monta Ellis scored 20 points apiece and the Mavericks extended Indiana’s season-long skid to four games with a 105-94 victory against the Eastern Conference leaders Sunday night. The Mavericks had lost three straight, capped by a woeful defeat in Denver, before coming home to beat a pair of playoff teams in Portland and Indiana. Dallas had to rally past the Trail Blazers in the fourth quarter after blowing a 30-point lead, and the Pacers came back from 17 down in the first half and almost wiped out another double-digit deficit after halftime. "In these two games, we’ve run the gamut of virtually everything," Mavericks coach Rick Carlisle said. "The early big lead, losing the entire lead, getting down and fighting back. And tonight, this is a top-two team in the league. We did it by keeping a real even, strong disposition." Paul George had 27 points and 11 rebounds to lead the Pacers, who stayed a game and a half up on Miami for the East lead after the Heat lost in overtime to Chicago. Dirk Nowitzki scored 14 points on a tough shooting night as the Mavericks swept the two-game season series from the Pacers, who were coming off their most lopsided loss in a 26-point defeat at Houston. "Stay the course," Indiana coach Frank Vogel said. "It’s a tough stretch of the schedule. We knew it was going to be tough. You’re going to have to play at your best to win at Dallas, at Houston." Carter’s gritty offensive rebound led to a 3-pointer from Harris, and the 37-year-old Carter hit from long range a short time later to put Dallas up 87-77 midway through the fourth quarter. "It’s a spiritually uplifting play for our team and everybody in the arena," Carlisle said. "You see a 37-year-old guy go up three times and then tear it down. That’s big time, and he’s showing you how much he wants to win." Indiana was within 89-87 when Harris, who had a season high in points, had his fist-pumping three-point play and Nowitzki hit a pair of free throws. Ellis, who matched big men Nowitzki and Sam Dalembert with eight rebounds, put the game away in the final 2 minutes with a pair of jumpers that gave the Mavericks yet another double-digit lead at 102-92 with 56 seconds left. "We really responded after losing three in a row," said Harris, who also had a season-high four steals. "Obviously we started off well and ended well, but had some trouble in between." George was right on his scoring average from his last two trips to Dallas, but the Pacers couldn’t get the defensive stops needed to make it three straight wins in Dallas. "They just made big shots," George said. "Monta got hot and hit a couple of big shots. Game over." Lance Stephenson kept Indiana in the game early with 18 first-half points on 7-of-8 shooting, but was limited by foul trouble in the second half and finished with 21. George Hill scored 20 for Indiana. Shawn Marion scored 12 for Dallas, and Jose Calderon and Carter had 10 apiece. Dallas’ reserves outscored Indiana’s 41-4. A sluggish offense had a lot to do with the Pacers’ early deficit, and their inability to finish a second-half rally. In the first half, Indiana had one shot-clock violation and three other times when the buzzer went off after a shot was taken. Then the Pacers hit just one basket in the last 4 minutes after getting within 92-89 on shot inside by David West. "They made more plays," Vogel said. "That’s the kind of thing that’s been happening to us on a gamely basis it seems like." Nowitzki had plenty of open looks in the first half but just couldn’t hit many, finishing 2 of 8 with five points before halftime. He was 3 of 14 from the field for the game. NOTES: Mavericks F Jae Crowder left the game with an abdominal strain. … Dallas recalled G Gal Mekel from the NBDL. He played three games for the Texas Legends in his first action since right knee surgery on Jan. 17. … The Mavericks honored Mike Modano at halftime a night after his No. 9 was retired by the Dallas Stars in the same building. … A fan won $10,000 at halftime by getting three giant, inflatable dice to land on a dollar sign, drawing a huge roar from the crowd.